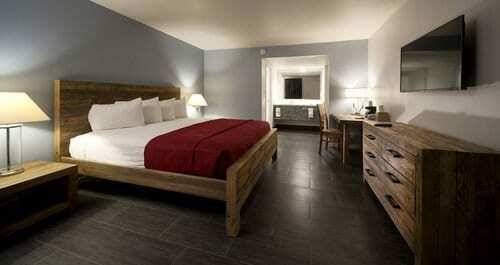 The Thunderbird Hotel ,1215 Las Vegas Boulevard South, ideal for couples, families, and people visiting on business. The Thunderbird Hotel is a boutique hotel close to the legendary Las Vegas Strip, this makes it the perfect spot for anyone that wants to have an unforgettable time in the entertainment capital of the world. 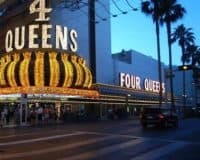 While as a boutique hotel it provides a unique perspective on the Vegas experience, with a quirky décor and good amenities. 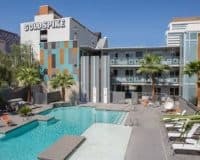 The hotel provides a decent range of amenities, including a refreshing outdoor pool, where you can cool off during the hot Nevada summers, free parking for those who bring their own vehicle and easily accessible WIFI that can be found throughout the property. It also provides a boutique bar and restaurant along with a wedding chapel for those who want to have that special moment in Las Vegas. The accommodation is comfortable with each guest room featuring a 42-inch LED TV, coffee making facilities, ironing facilities and a spacious ensuite private bathroom. The rooms are also air-conditioned, and some provide views across the bright lights of the city. 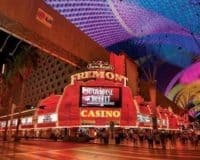 The Thunderbird Hotel is an excellent choice for anyone who wants to have a unique experience in a well-located Las Vegas hotel. This makes it ideal for couples, families, and people visiting on business, who don’t appreciate the larger Vegas establishments.